With a talented group of eight cast members and a historical story, “Aide et Réconfort” showcases the meaning of loyalty and nationalism. Belmont University’s Department of Theatre and Dance is set to open the John J. Kelly play on Friday in the Black Box Theater. 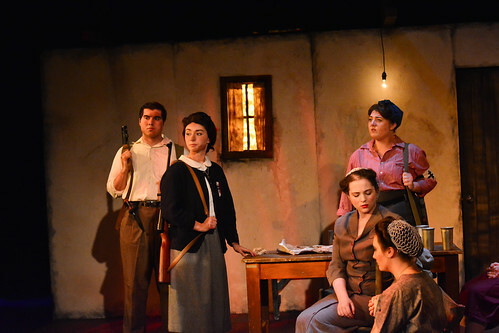 Directed by Courtney Schuster, the show tells the story of a group of female resistance fighters during the last year of World War II. As some of the women are taken as prisoners, the debate begins over what it means to betray their country for their safety. Senior Veronica Ostroski, who plays the role of Brigitte, hopes to embody her character’s courage and loyalty to her friends in her own life, she said. “Brigitte is someone who I strive to be. She is a very brave woman who knew that she was there to protect her kids and she did what she could to do it,” said Ostroski. While some characters are very blunt about their stance on the war, one character in particular prefers to stay in the background. “I’m very neutral on a lot of things. I just want everyone to be safe and to get through this. I’m not really into the whole political posturing and aggressive attitudes of other people,” said freshman Jackson Harris of his character, Henri. With the topic of honor and duty looming over the characters’ every move, it’s the outcome of each character’s decisions that has them questioning the choices they’ve made. “Each person goes through different things and has all their choices, but at the same time, we still need to be held accountable for our actions,” said Ostroski. The play will run until April 14. Students can reserve ticketshere and receive CPA convo credit for attending. This article written by Tina James. Photos by Liz Gresser.